Love it, one question- is there a capability for guest to submit a review or not yet? @BlueMtnCabins: Not yet, no. That's on the list to do, but honestly it's towards the back of the list. We want to mostly stress the collection and storage parts of it, right now, because so many of your reviews will be on other marketing channels. And that's what you want to push - guests leaving reviews on other listing sites. That's where the lion's share of your booking traffic comes from, so continue pushing guests to leave reviews on TA, VRBO, Air, FB and Google. The big engineering focus for us is in making easy way to export/import those reviews FROM those sites so that you can store it all back in OR and then show it on your website (or do other things with it - biz intelligence, reporting, automation). 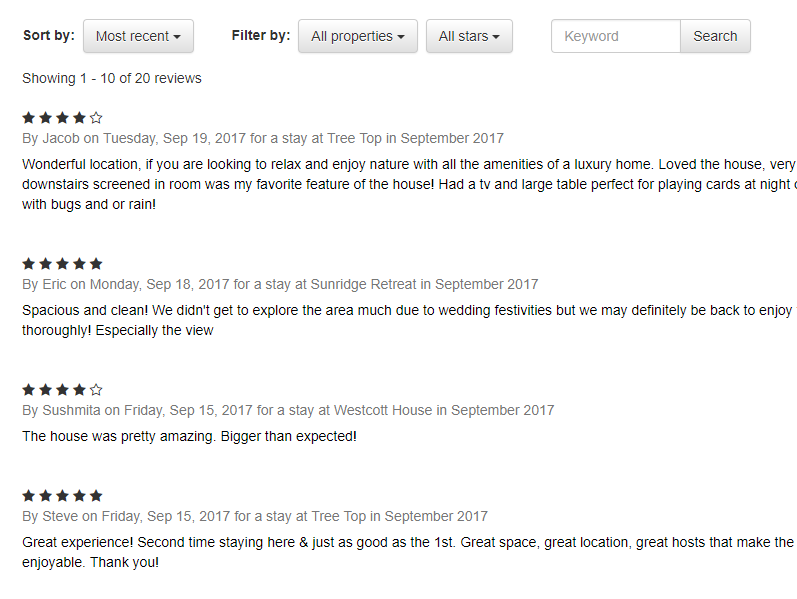 If guests left reviews on your website, that's great, but those reviews can never be pushed out to TA, VRBO, Air, FB or Google so they have limited value. This is great news--thank you! The sample page didn't show owner responses, but will the system allow the posting (& eventual importing of) the reply to the review? Yes, it will! Our current widget doesn't show the owner response and that is vital if you're showing a critical review. We will make sure to add that. We'll also be adding the listing site it was left on with a filter option so that they can see where the review originated (talking about the widget). The import/export features we're working on will pull in all that information - yes. There is actually a lot more information we've found like helpful vote count, private feedback, user avatar and more. We will store as much of that information as we can.